When people think of Orlando, Disney World or Universal Studios are usually the first attractions to come to mind. Since I visited Orlando earlier in the year, I was looking to explore a few local attractions. 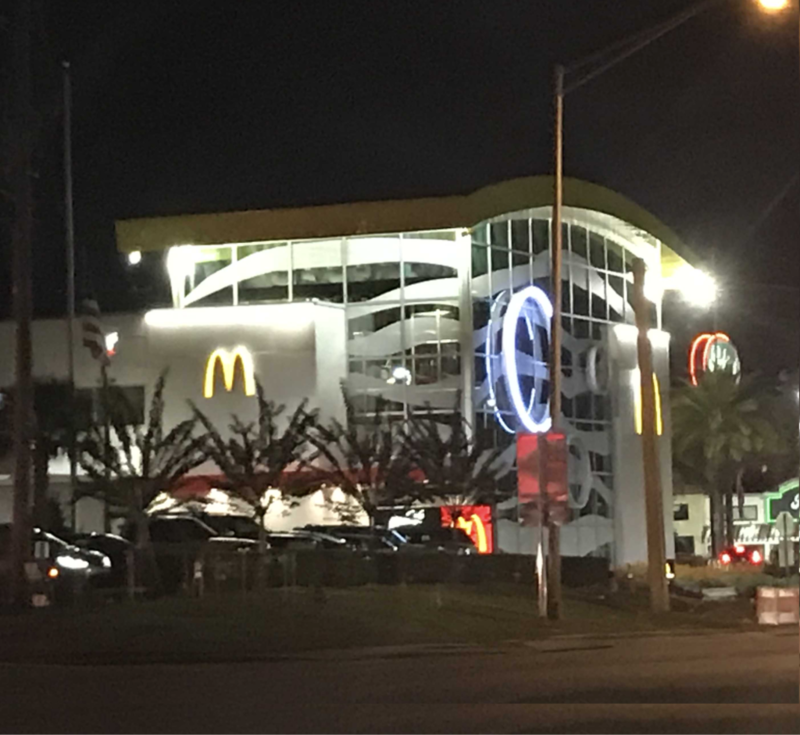 When I learned that the new world’s largest entertainment McDonald’s (at 19,000 square feet, located at 6875 Sand Lake Road off of International Drive), I decided it was worth a visit. It’s hard to miss the fish tank in the middle of McDonald’s. It’s different. It’s also little out of place. The cakes stood out to me too. Because, well, they looked delicious, especially the cake on the left. You can order from the traditional menu, and you can also order a custom pizza or pasta at this McDonald’s. I’m not big on pizza, but the thin crusted pizza was good. They were gone in no time. Since we were “dining in”, we got a number and a staff delivered the food to our table. Kids would enjoy the entertainment center on the second floor. Games. Win tickets and redeem for prizes. The Super Mario game looks fun. The McDonalds is the world’s largest in terms of square footage, but it didn’t feel that way to me (mostly because most of the square footage are tied to the entertainment center). At the time of my visit, the place was rather busy and somewhat crowed. It feels like a regular McDonald’s but with a little more space and some novelty food items. While I wouldn’t necessarily go out of my way just to visit this McDonald’s, it was still worth a visit since I was in the neighborhood. Have you visited this McDonald’s? Are you planning to visit the world’s largest McDonald’s the next time you visit Orlando area? The post Inside Look at the World’s Largest Entertainment McDonald’s appeared first on TravelUpdate. Ever heard of the “Disney Sea” theme park at the Disney Resort?